So begins a Psalm of penitence and faith that speaks from the depths of despair to the depths of the Lord’s love. This famous Psalm, long used to pray for the dead, provides excellent ground for reflection on this fifth Sunday – a Sunday when the readings treat of the mysteries of life and death. The simple language of this Psalm is profound in its capacity to express repentance, sorrow, longing, and trusting faith. It moves from the awareness of our unworthiness, to praise of God’s merciful love, to hope in that loving kindness of God. Life and death are at issue in the prophecy from Ezekiel in the first reading. This prophet of Exile spoke in metaphor, imagery, and symbol. And he addressed a people who considered themselves lost - beyond redemption. All they though mattered had been taken from them. In loneliness and despair they mourned their fallen temple and lost land of milk and honey. This passage follows on Ezekiel’s vision of the valley of dry bones – bones that are miraculously knit back together and infused with life by the Word of the Lord. Now Ezekiel teaches the meaning of the vision – God has the capacity to bring life where there appears to be naught but death. Just as the prophets had promised doom to an arrogant and sinful people in the past, now the Lord promises abundant new life to a people bereft. The prophecy concerns the fate of an exiled people, but it comes to represent so much more in Judaism and Christianity. It is a vision of God’s creative power. As such, it teaches that the God Who brought life from nothing can and does bring life from death. It is a vision of sublime, radical, and transforming hope. 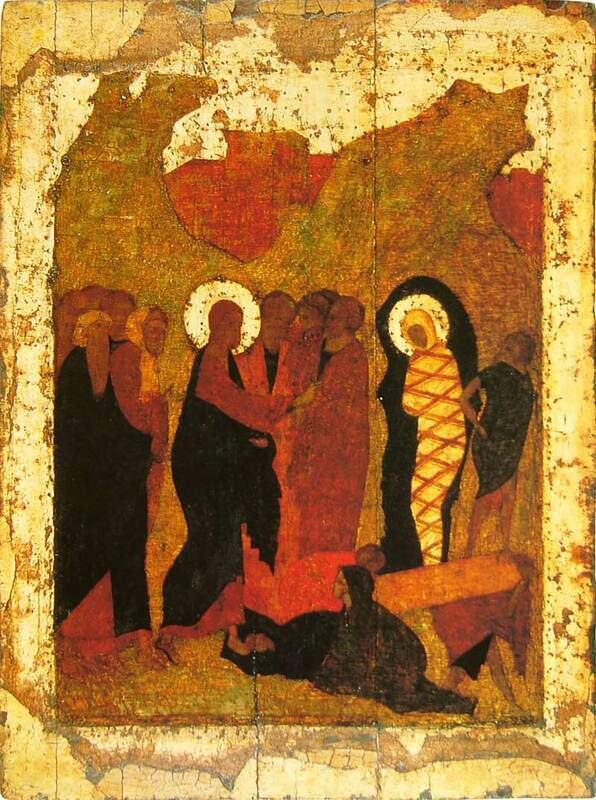 The passage from John, relating the raising of Lazarus, displays that same life-giving power at work upon dead flesh. If Jesus’ followers wondered before at the radical nature of His claims and the extraordinary nature of His deeds, now they must stand speechless as He exercises the power of life itself. And if His enemies loathed Him before, now they can do no less than seek to obliterate Him. It is difficult to do this passage justice given its length, importance, and drama. For now, we should notice that the passage continues the revelation of Jesus’ exalted identity as the Glory of the Father. Even as it does so, it raises a mirror to the human participants. They must respond to Him in one way or another. And we see their struggle. The disciples continue to misunderstand. First, they would hold Jesus from the destiny that He must face if they are to be saved. Then they misunderstand His words and think Lazarus merely asleep. Martha and Mary, who love the Lord, must move beyond their limited understanding of reality. They must come to see the truth of Jesus’ identity and in this to perceive the presence and work of God in their midst. Both women call Him Lord, but it does not occur to them that He would have the power of God – the power to reverse the finality of death. And the crowd weeps with the women – the keening and crying of the mourner. Their cries demonstrate their failure to grasp the truth of the moment. And so Jesus weeps – here the text uses a different word for weeping – His is not the wailing of the mourner, but the tears of a man frustrated and disappointed that they still fail to recognize Him as the One sent from God. And so the Lord exercises that word of redemption from Psalm 130. He restores life. Sometimes we make too much of the tears of the Lord. They matter less than the deed of the Lord in this moment. It is not His sympathy, but His redemptive love that shows forth the Glory of God. As Paul wrote to the Romans, he reminded them that this redemptive power of the Lord liberates the Christian disciple in the here and now. Indeed, the Christian hopes for liberation from the bonds of death. But to know the grace of God is to know a renewal of life even as we continue in the world. Paul experienced that change in his own life as the Lord lifted him from the depths of sin and gave him a new zeal – a zeal for love rather than violence. The man who once hated the other now gives his life to the salvation of the nations. Centuries later, the same truth overflows from our altars. The Crucified One has been raised. His life’s blood flows for our redemption. Even in the depths of our sin and human frailty His Spirit would bring us back from the brink, put flesh and sinew on our dry bones. As we draw close to Holy Week, we cry from the depths for that life and power – that Spirit – to dwell within us.